You will find quite a number of completely free of charge Slot Apps available at the Google Play Store, and one of these is the hugely popular Jackpot Party Casino App. However, this slot whilst offering you a range of free slots it can be something of an annoying App as can many of the other ones which are available. What you will find when you download one of these free Slots Apps is that you are initially only permitted to play one slot, with all of the other slots on offer locked until you have played through and earned a high amount of points. These points are awarded on each spin you play, and what makes the additional slots even harder to unlock is that you will be given just one set of free play credits initially. Once you have used up those free play credits you will then have to wait several hours until you get them restocked with another set of free play credits. However, you will be given the option of making an In App Purchase, which means you can buy with your own cash a set of additional free play credits in between you being awarded your free set of credits, and this is often how the App supplier is going to make money off users of those Apps! Anyone who is experienced at playing at an online or mobile casino sites is going to be wondering why anyone would every wish to purchase a set of free credits on which they can never win anything! In fact we are puzzled why players would do such a thing, but believe us there are a lot of players who do spend a small fortune purchasing free play credits when using Apps such as the Jackpot Party Casino one! Having read above that you are only ever going to be awarded a set number of free play credits often every few hours when playing slot games on slot Apps, you may be put off giving them a try! However, there are some Slot and Casino Apps that are going to allow you to play for as long as you like and whenever you run out of playing credits you can get them topped up for free and instantly, without having to wait around for hours. One of these Apps is the Vegas Paradise Casino App, now this casino is actually a real money casino site at which you can play any of their games for real money and any winnings achieved are obviously yours to keep. But they do allow anyone over the age of 18 to download, install and then play any of their slot and casino games as a free player. You will never be charged anything to either use the range of games as a guest player and you will certainly not be charged anything to top up your free play credits when you run out! 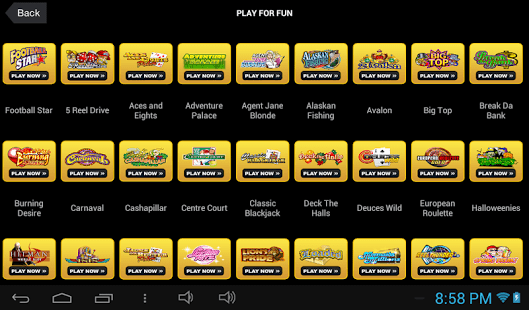 There are many great playing slot games available on the Vegas Paradise Casino App, and below is a small overview of just some of their slots, which should allow you to get an idea on just how diverse their suite of slot games is. Tally Ho Slot – The first free slot game you may enjoy playing on your Android device that we would like to introduce you to is the Tally Ho slot. This is one of the older video slots from Microgaming which will award you with free spins whenever three or more scatter symbols drop onto the screen. In addition to the free spins bonus game you will also be able to take an optional gamble game whenever you have spun in a winning combination. Loaded Slot – This multi line video slot game is one of only a handful that when you spin in three or more scatter symbols will let you then pick one of several different options in regards to how many free spins you will be able to play off and also the multiplier values attached to those spins! If you enjoy playing free spins awarding slot games then this one is going to liven up your slot playing sessions and allow you to chose a low, mid or high variance type of free spins feature round! Alaskan Fishing Slot – This slot game is what is known as an All Ways slot. If you have never played one of these types of slots before then make sure you give this one a try. For by doing so every time you set the reels spinning when they then come to a stop you will have a huge 243 ways of forming a winnings combination! Big Top Slot – You will find several video slot games which are classically designed, and by this we mean that when playing them you will not trigger any type of bonus game features. One of these slots it the 9 payline Big Top slot, and whilst you may not be attracted to play it due to the lack of bonus feature rounds it does come with a high payout percentage and a regularly spun in base game jackpot! Couch Potato Slot – This slot is a single line, three reel mobile slot game, and it gives players the option of playing three coins per spin. It is worth taking a look at the pay table attached to this slot for you will notice that when playing three coins spin a jackpot worth 15,000 coins is on offer. This slot is a high variance slot and as such be prepared to play it and see no winnings combinations forming spin after spin but also be prepared to win some huge sized winning payouts from time to time! If you wish to give any of the above games some play time for free, then simply log onto the Vegas Paradise Casinos mobile website where you will be able to play them to your heart’s content for as long as you like, without ever having to spend anything.